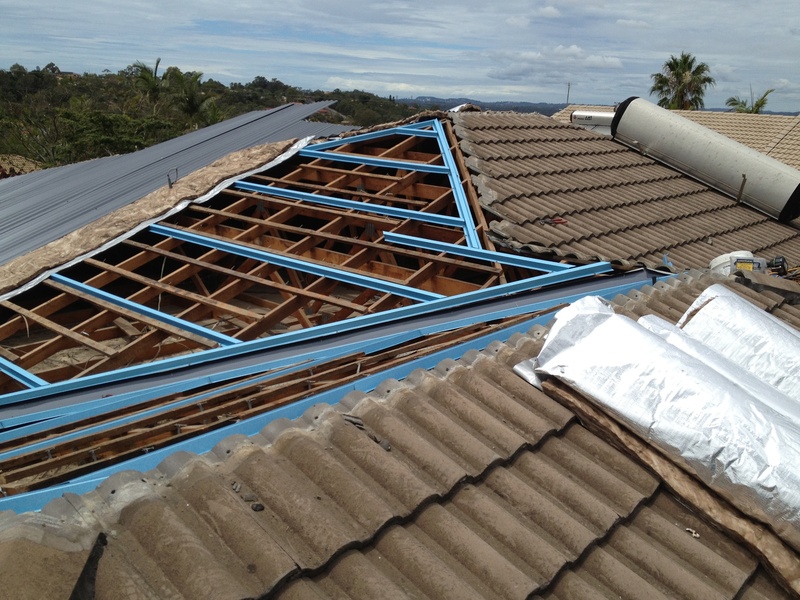 Roof replacement from concrete tile to Colorbond or Zincalume Roofing is an extremely common process that is often undertaken by home owners that have concrete tile roof that has reached the end of its life. 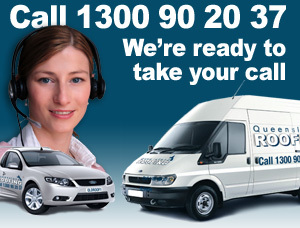 You can replace your tiled roof with a new Colorbond roof in one of the many Colorbond colours. Or you can opt for a straight metalic Zincalume finish. If you are unsure of which Colorbond colour to choose make sure you check out our video on choosing colours. Roof replacement from tiles to iron usually comes about after one of the the following issues has occurred with a tiled roof. 1. Hail damage or storm damage to the roof rendering an opportunity for the owners to move to an iron roof. 3. The concrete tiled roof has been painted and restored multiple times and cannot successfully be restored again. 4. The roof is in an extremely leafy area with the break down of tree matter causing leaks between the tiles. Roof Repairs are being performed to the timbers and/or structure of the roof due to termite damage, please refer to our section on termite damage and read about the tile to iron re-roofing process when truss or rafters need to be replaced. When a concrete tile roof is replaced with Colorbond or Zincalume there are a few Australian Building Standards that need to be adhered to. 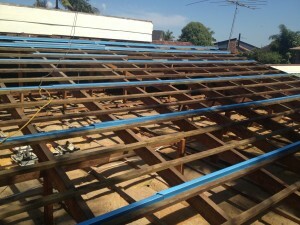 This is due to the fact that the new Colorbond roof will be much lighter than the original concrete tile roof. A new Colorbond roof weighs a lot less than concrete tile so the roof timbers need to be tied down. 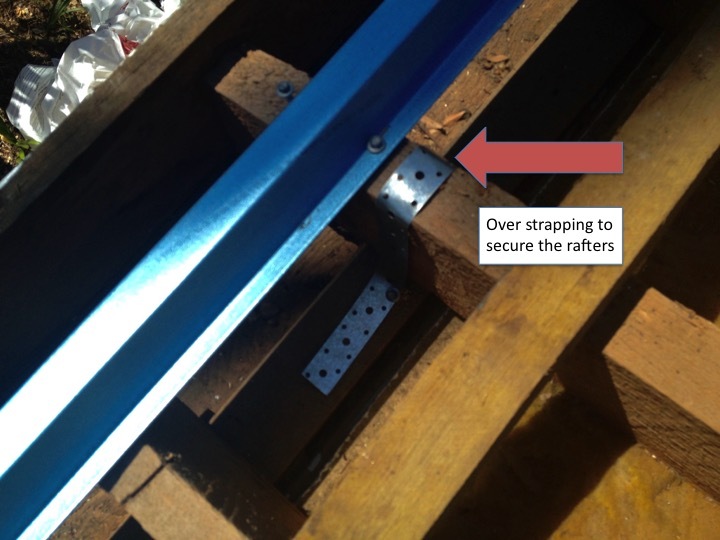 The photo below shows the patterns that is used with the 40mm top hat metal battens that have been prepared for the the metal roof to be installed. Due to concrete tiles needing a shorter batten pattern and also a thinner batten, the timber battens will not suffice for a metal roof. All these battens are screwed down in preparation for a metal roof. Moving from tile to iron when there are hips and valleys required more set out time. One of the other things that needs to occur when you are changing a concrete tiled roof to an iron roof is the ends of the rafters need to be strapped down. This over strapping is another essential part of preparing the new roof for the fact that because the metal roof will be much lighter that the tiles in needs to be braced to the house. There a have been situations when this step in the re roofing process has been missed and resulted in the roof literally lifting off. Here is the over strapping that fixes the rafters down before the Colorbond roof gets put on.